Chrissy, this is a lovely card! I like what you did with the embossed tree. It is very elegant on it's own! Great idea with the Christmas card list, every year I say I'm going to do that and never do. We should challenge each other to get our lists together, then maybe this would be the year I actually do it! I don't even have Christmas cards I've been making for recent challenges gathered together in one place...so I don't know how many I even have done. aarrgghh! Oh, well! Anywhooo, I enjoyed looking around your blog...I'm sure I'll be back to visit again! An elegant, tasteful card. I love it! Great use of the new CB folder! Love how well it works with the OCC sketch - thanks for playing! It sure is a fantastic embossed tree. Gosh, I love this one! That looks so beautiful. This is gorgeous!! 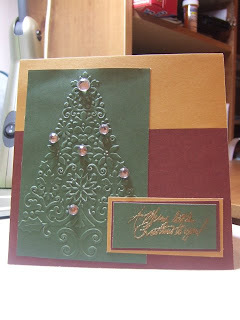 I love the embossed tree!